Maxxis Bighorns are a mud terrain tyre that has been on the market now for several years. The previous Mud Terrain tyres by Maxxis were known as Maxxis buckshot’s. Maxxis have already proved that their tyres are brilliant on quads and racing cars, meaning there is no reason not to expect a great 4×4 Tyre for driving a 4×4 in the mud! 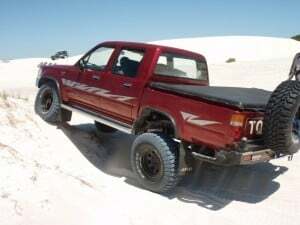 I purchased 5 Maxxis bighorns on My Hilux about a year ago now, and I have been using them both on road and off-road on the beach, dunes, rocks and mud. What pressure should I run my Bighorns at? This should be largely decided by the weight of your car, and the terrain that you are driving on. For on road use, the Maxxis Bighorns have a maximum rating of 35 PSI. Generally, the bigger the tyre that you have on your car the less pressure that you need in them on the road. Of course, you ought to check and test with what works best. 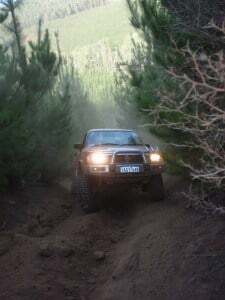 I run my Maxxis at 30 PSI on the road (being a light Hilux and they wear well at 30). On the beach I will usually drop them down to 15 PSI, but I won’t hesitate to let them down to 10 if I am struggling in soft sand. If I am just driving on rocks or through mud I usually just let them down to around 18 PSI. Of course, if your car is heavier you might need to keep them pumped up more, but just do some research and testing to see what works. 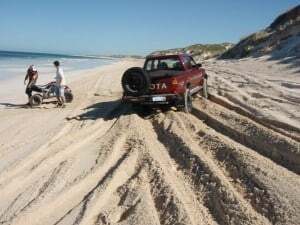 For Beach Driving, in between 15 and 18 PSI is generally the right pressure on larger four wheel drives. The biggest mistake I see people doing is not letting their tyres down when they are off-road. This is especially important when you are driving on sand, as it increases your footprint dramatically, and makes your car float on top of the sand rather than digging down. If you have tyres pumped up tight, then they tend to sink down and dig holes. 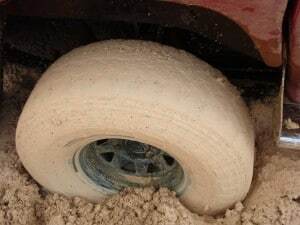 When driving through bushland, it’s much easier to get a puncture in your tyre if you are running them at a high pressure. You can take a normal balloon that is not pumped up much and push it onto a sharp rock (carefully) and it will not burst. Get the same balloon and pump it up tight, and it will pop the second you touch it on the rock. It’s really the same principle with tyres, and letting them down to the correct pressure will save you a lot of money in the long run. Are Maxxis Bighorns any good in sand? Some people find mud tyres work better than standard tyres on sand, and others find the opposite. The fact is with Maxxis Bighorns, you shouldn’t struggle on the beach. My set is 12.5 inches wide, which gives them a slightly bigger footprint anyway. The trick with these tyres is to let them down enough so that they work effectively. If that means letting them right down to 15 pound, then so be it. I find that they love to dig holes (because of the aggressive tread) but they tend to pull through soft sand. Just make sure they are let down to a safe level which doesn’t overwork your car. You can get bead locks, which will prevent this, but they are an extra expense and may not be legal where you live to drive on the road. If you are a big sand driver, then perhaps purchasing a set of all terrains would be a better idea. However, in terms of compromise between a tyre which is exceptionally good in the mud and on rocks, the Maxxis Bighorns do very well. What pressure can I drop them down to if I need to? I haven’t needed to drop my tyres down to anything below 10 PSI. If you really needed to though, you could probably safely drop them down to 5 PSI for getting out of a sticky situation. It’s not advisable to drive like this for long without bead locks; make sure you pump the tyres up a bit once you are out of trouble. Always remember if you are really in trouble, a set of tyres is probably worth less than the value of your car. If the tide is coming up, then wrecking a set of tyres will usually be worth it to get out of trouble! I always advise having a set of Max Tracks or some shade cloth with you to help get out in soft sand anyway. Make sure you have a good Car Air Compressor for when you are done four wheel driving. I have heard a number of people mention that their Maxxis Bighorns did around the 80,000km mark. I have done just over 17,000 on my Maxxis Bighorns, and they have worn very little. Brand new, they come with 14.5mm of tread, and mine still have around 12mm left. My set look to do even more than 80,000km which is great! Of course, if you drive purely off-road then they will obviously wear quicker. It also depends on how you drive. If you like spinning your wheels on rocks and taking off quickly from the lights then they will not last as long either. Something I highly advise is proper tyre rotation. When you spend over a thousand dollars on rubber, you want to make sure that they are going to last as long as possible. I even include my spare tyre in the rotation, because otherwise you end up with a brand new tyre in a few years time that has hard rubber and a tyre that isn’t reliable anyway. You may as well use it, and include it in the rotation. The more regularly you rotate the tyres the longer they last, but 5,000 to 10,000 intervals will do just fine. I normally rotate the front right to the back right. The back right goes to the spare. The spare goes to the front left, and the front left goes to the back left. The back left goes to the front right, and after 5 rotations you are back at the start. Different people will have different opinions on the best way to do it, so be sure to do your research. Overall, just make sure that the tyres are not staying in the same place for too long, because they will wear out much quicker if they do. 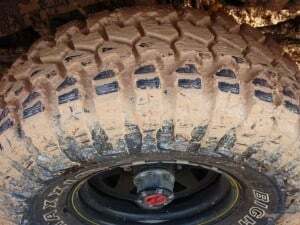 How strong are Maxxis Bighorns? In terms of the sidewall rating, they are not as strong as some of the tyres that you can purchase today. 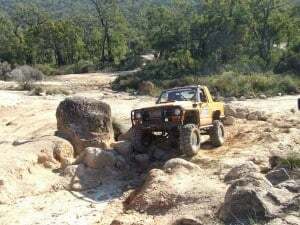 I would suggest that if you are going to do a trip across Australia, maybe look for some other tyres than the Maxxis Bighorns (depending on where you are going). In saying this, they are not weak tyres. I have only damaged one, when a rock dented in my rim and pinched the tyre a little. It put two cuts through the rubber, but it doesn’t leak. The side grabbers work very well, especially on slippery clay or rocks. Maxxis Bighorns are very cheap compared to other brands. They are not the cheapest mud terrain tyre, but they are definitely in the lower part of prices. The more expensive tyres include BFG Goodrich muddies, Goodyear Wranglers and Cooper STT’s. Whilst these may be good tyres, they are considerably more expensive. I purchased my 5 Maxxis (33 x 12.5inch tyres) for the same as a friend purchased smaller Cooper STT muddies. It’s a fairly big saving point, but entirely up to what you need the rubber to do. 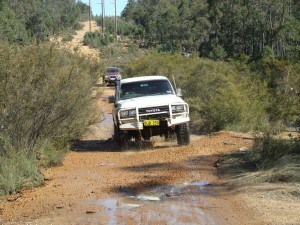 Earlier this year, the 4×4 Action team in Australia did a comparison of mud terrain tyres. The only thing that they really missed out on was wear after several thousand kilometres, but none of the tyres that they tested were damaged. The number one winner was the new BFG Goodrich muddy, and second place was the Maxxis Bighorn. 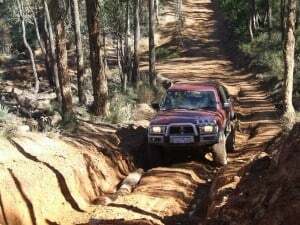 This was taking into consideration a huge number of factors such as braking ability, on road handling, noise, sand, mud and rock driving as well as a few other bits and pieces. They really do perform very well. Where is the best place to get them from? Are Maxxis Bighorns any good? My overall opinion of these tyres is that they are huge value for money. When you consider the big price difference, and the wear that you get out of them, they are great. I love the fact that they are great in mud, they look good and they don’t break the wallet to get a set. In fact, I paid the same amount for my tyres as my dad did for a set of normal highway tyres for his Pajero, and they will do more kilometres than his! 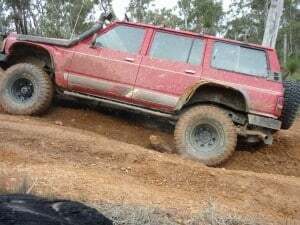 In terms of a comparison between other 4×4 Accessories that I have fitted and these tyres, I made a good decision in getting the Maxxis. In fact, if you look around for reviews on the four wheel drive forums for Maxxis Bighorns, almost everyone says that they are great value. My next set of tyres will definitely be a set of Maxxis Bighorns. Was a bit unsure of them but they do get alot of acclaim. Will be picking up a set this week! That’s good mate. I bet you won’t regret getting them. Keep me updated with how they go. thanks !! extremely helpful post! Wow! Thank you! I often wanted to write in my site one thing like which. Can I get important part of your post to my weblog? Nice Information! I personally really enjoy your writing. This is a great website. I will make sure that I stop back again!. Great content thanks for the post please post more things relating to this! I would like to thank you for the endeavors you have made in composing this article. I am trusting the same best work from you in the future as well. In fact your imaginative writing abilities has prompted me to start my own blog now. Really the blogging is spreading its wings rapidly. Your write up is a fine instance of it. Try using the 4 PSI rule – should give you a fairly accurate reading. Let your car sit for 12 hours, and check the tyre pressures. Drive it for an hour, and then re check the tyre pressures. If they have gone up by less than 4 PSI you need to let them down, and if they have gone up by more than 4 PSI then you need to pump them up. Google the rule for some more information. Thanks! The powerlines sure is an interesting track. There hasn’t been a single time that I’ve been out there where I haven’t seen something break.